2. Finished with OPI RapiDry top coat (seen here), or Seche fast drying works just as well. The manicure ended up lasting an extra week longer than usual. 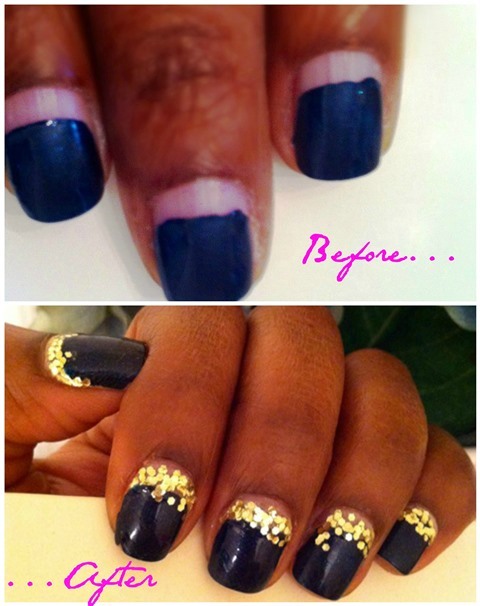 I thought it's such a quick solution for those who get the gel manicure and might not have the time to go to the Salon. Like I mention above - the manicure lasts three weeks with no chipping or dulling. ~ The exposure to the UV light (which tingles by the way) once they put on the gel color and it feels much hotter on the skin than I think it should. ~ You waste a good 45 minutes to an hour getting the nails done. ~ You have to go get the nail polish removed professionally so as not to damage your nail beds if peeled off. ~ Frequent use of the gel manicure actually weakens your nails from all the filing that they do after soaking the gel off your nails. The good news: Now they have regular gel nail polishes (in an array of colors that are much more inexpensive) that can be applied at home with a drying time of 5 minutes - promising no more dings or smudges with a lasting shine and easy to remove. I think it's one route Kelly wouldn't mind going for because you can change the color as often as you want since it applies like a regular nail polish. AND, it's UV light-free/less time consuming! PS: I'll be using the new gel nail polishes now that they're available. That is a really great creative improvisation! Always thinking outside the box!